Chime Master's inSpire™ Twelve, a two-way, full-range loudspeaker system is engineered to provide authentic bell reproduction in outdoor bell towers and steeples. Tested to an ingress protection of IP45, it will withstand exposure to environmental conditions and provide long-lasting reliability. It incorporates a 12" LF driver and 1" exit HF compression driver concentrically mounted to a high-directivity waveguide for downward omnidirectional (90x90 degrees) or outward horizontal projection (90x40 degrees). The unit is constructed using molded linear low-density polyethylene (LLDPE), creating an incredibly strong yet lightweight enclosure. The unit includes a stainless steel U-bracket and fly-points allowing for easy mounting. Input is via an integrated 70.7V transformer with low insertion loss and full frequency response with power taps up to 400-watts including an 8Ω bypass. 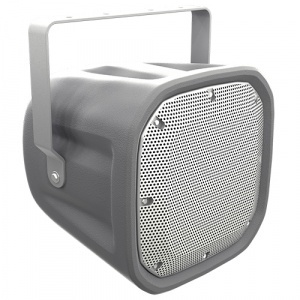 The transformer is discretely mounted under the rear cover for weather protection. The finish is neutral armor gray that is UV resistant to provide years of durability. This page was last modified on 22 May 2017, at 12:36.